Kids Kick Boxing: Is it Effective? In our kids karate classes in Sydney, we have taught kick boxing techniques since day one. 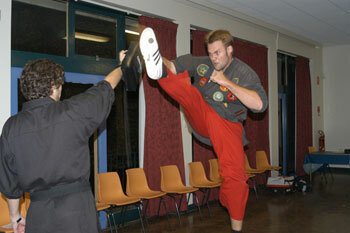 Kenpo has a long history of combining the traditional techniques and forms with kick boxing. The great Joe Lewis, one of the first world champion kick boxers, introduced it to the American Kenpo system in the 1970’s, and it has been taught ever since. Kick boxing in America evolved from full contact karate. Boxing’s punches, such as the jab, cross, hook, and uppercut are combined with the kicks of karate, such as the side kick, wheel or roundhouse, and snap kicks. Boxing punches build on each other to form super fast and powerful combinations, which can stop an attacker dead in their tracks. Add the thundering kicks of karate and you have an art that is effective at every range. The techniques of kick boxing are dead easy. The punches are much simpler to master and remember than complex forms or self-defence techniques. Put a couple of punches and kicks together and you have a very effective means of protecting yourself. For kids this is especially important as they lack the cognitive abilities of adults. How do you practice eye pokes or kicks to the knees? It is very difficult to spar using traditional martial arts techniques that can maim a person. However, kick boxing, with the proper safety equipment, lends itself to sparring like no other art. With strict rules in place, kids can practice all their kicks, punches, and blocks against others in a safe environment, successfully mastering them well enough for proper self defence. 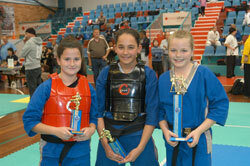 Our tournament team, Kenpo Freestyle Sydney, has produced its share of full contact champions. These young warriors have successfully used their kick boxing skills in the ring. When is a Child Ready for Martial Arts? 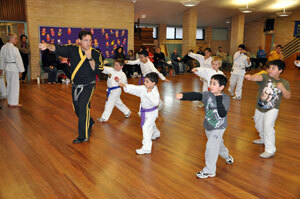 Kids learn about respect, balance and coordination, and have fun in a martial arts class. “How old does a child have to be to start martial arts?” This is a question I get asked all the time. In China, kids start Wushu as young as three. Many martial arts instructors in all styles start their own kids as soon as they can walk, usually in their twos. To me, three is the absolute minimum. But the real answer is–it varies. Yes, it depends on a few factors. Let’s look at them. Has your child been involved in any structured group activities, like pre-school or other sports? Was he or she able to function without your help? Were they content to stay in the class or did they keep running in and out of it, when it suited them? If you have any doubts here, go to a martial arts class or two and watch it with your child. Are they able to see how the kids function in a proper class and what is expected of them? Is your child able to follow simple instructions? Are they able to stand still and stay focused for at least a few minutes at a time? Although a good instructor will vary activities during the class, your child must at least be able to focus on each drill or game. At the pre-school age, children learn primarily by copying, so it is important they be able to do this. Is your child able to accept discipline without throwing a tantrum? Do they understand that they cannot always have their way? Are they able to wait for their turn? A child who insists on always being the center of attention takes too much time away from the others. Children having difficulty in this area will almost always be asked by the sensei to return when they are older. What are your expectations? Martial arts for a four or five year-old should be about fun, focus, and developing coordination and balance. You should not be worrying about creating the next Bruce Lee at that age. If you put children in high-pressure situations, they will lose interest in the activity. This is probably the most important, though overlooked factor. Is the program set up with small children in mind? Does the class separate children by age and experience? If a class includes 3 to 7 year olds of all different levels, it is going to be extremely difficult for the three year-olds. We have special Tiny Tiger programs at selected locations, for three and four year-olds. For the three and four year-olds, it is enough to get them used to moving around, getting organised into circles, lines, etc., following directions, simple blocks and evasions, and most important, having fun. Older children, usually five and above, start to learn the more practical self-defence aspects of the martial arts as they can better understand when it is appropriate to use it. Getting your children started as soon as they are ready gives them an edge. Life skills such as coordination, balance, concentration, socialization, respect, and self-discipline will be promoted in a good program. Seek out the best martial arts school for your child and good luck! When is a Child Ready for Martial Arts? is an original article by Sensei Matt Klein. Can Martial Arts Help Children in School? Skills like focus and memorization are learned in martial arts, helping kids in their studies.. I am a firm believer in education. There is no doubt education prepares children for success in life. Reading the Saturday paper to scan the employment ads; writing a thank you letter to someone who interviewed you for a position; creating a good resume; making the correct change from a fifty; these are essential skills in today’s competitive job market. Skills we hope our children have as they approach the age of adulthood. Can the martial arts help kids do better at school? Definitely yes. Discipline. Martial arts promote self-discipline in a way that few other after-school activities can match. The high standards, focus on the achievement of goals, emphasis of individual self-reliance over group, and need to attend class regularly (even when they don’t feel like it), will carry over into their school life. Ability to memorize. The ability to memorize is taught in the forms or kata in the martial arts. These forms or sequences of martial arts movements can be fairly complex and can really test ones ability to remember them. This stimulation of the brain helps children remember their studies better. Ability to focus. Students must watch, listen, and engage all other senses to learn the techniques, at the same time tuning out distractions. Parents of children with attention deficit problems have told me how the martial arts have helped their children focus at school. By the time these children reach black belt, they have a laser-like focus. Respect for self and others. Respect is something that will make or break a child’s efforts at school. Martial arts highly stress the value of respect and children will be at a big advantage at school and in later life if they treat others with respect. Respect for self means they will be able to resist peer pressure to get involved with activities that will get them into trouble at school. Accountability. The martial arts build accountability from day one. If you master a series of techniques, you earn your stripe or belt. If you don’t do your best, the disappointment you feel at not getting your belt will teach you to be accountable to yourself and try much harder next time. Being accountable to oneself is necessary for success in school, and also in life. Give your children the edge in school, get them in a martial arts program. You won’t regret it. There are other benefits of martial arts for children on this link. Can Martial Arts Help Children in School? is an original article by Sensei Matt Klein. Kicking like this takes years. You cannot expect to be an expert martial artist overnight. A children’s martial arts class is a interesting case study in psychology. With most kids, you can see and feel the joy of learning in their frantic, sometimes awkward, movements. For some, you can see the frustration—of not attaining perfection immediately. Sadly, many of these children give up martial arts. They feel that if they can’t do it perfectly, they won’t do it at all. Why are some children perfectly happy with small steps of progress, while others hate seeing themselves as weak, clumsy, or stupid? I tell my students that perfection is never possible, but striving for it builds their character. I also tell them to be patient with their progress, expect to make mistakes, and do not plan on becoming an expert overnight. Our society expects achievement from everyone, including kids. They come into my children’s martial arts classes expecting to excel right off the bat. They don’t understand that you have to learn martial arts in small steps. You don’t just go from step number one to step number twenty in a day. Some of this pressure comes from parents, who mean well, but expect their kids to be the best in the class. This is not always realistic. In many cases, the pressure to achieve comes from the child himself. Children can be very hard on themselves. I have seen boys and girls cry in class as their frustration sets in, when doing a complex move or kata. They get very angry at themselves. You have to pull them aside and say, “you are doing fine–relax”. It doesn’t always work. Children need to understand that mistakes are a healthy part of learning. Sometimes I’ll do a kata and throw in a mistake on purpose. I do this for two reasons. I want to see if anyone can catch it, and most importantly, to show them that we all make mistakes—even the sensei. Learn to embrace the fact that you are a beginner, when everything is fresh and new–you are laying the foundation for excellence with each step, as awkward as it may feel. Everyone makes mistakes—it is more important to do the best you can. Have fun and relax! 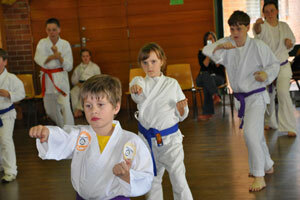 Children’s Martial Arts: Don’t Expect Perfection is an original article by Sensei Matt Klein. Every term I get new children with lots of notions about what the martial arts are about. Some of the comments I get are funny—you just have to laugh. But in the mix I hear the same martial arts myths that have persisted for years, maybe decades. Here are the most common. 1. Myth: Martial arts are all about kicking, punching, and fighting. Fact: Most programs teach avoidance of violence and respect for others. They highly discourage violence, and the higher rank one attains in the martial arts, the less likely they will have a need to prove themselves. Students who are in the arts for the wrong reasons are quickly weeded out by most reputable instructors. The ones who discover the true meaning behind martial arts—the respect, self-discipline, and improvement of oneself, and embrace it are the ones we want in our schools. 2. Myth: If you strike a person in the nose, you can drive the bones up through his brain and kill him. Fact: This is not possible. The nose is made up of mostly soft cartilage, which does not have the strength necessary to penetrate the skull. 3. Myth: A black belt must register his hands as lethal weapons. Fact: This myth has survived for decades, and there is no truth to it. There is no real regulation of individual martial artists in Australia or in the U.S.. Even if governments could afford to do it, which they cannot, it would probably be considered a violation of civil rights. There is nowhere in the world where martial artists are required to register themselves as lethal weapons. 4. Myth: There is one ultimate system of martial arts. Fact: The people who claim to have the best system in the world are after one thing–your money. The fact is, there are superior martial artists, but not martial arts systems. Every martial art has something useful, and every one produces champions and people who can successfully defend themselves. 5. Myth: Once you reach black belt you are a master and can now quit. Fact: Of course you can quit any time, but you are nowhere near a master at black belt. A master is usually someone who has spent over twenty years in the martial arts and is at least 5th Dan level. As a beginning black belt you are considered intermediate level in the whole scheme of things. However, it is still a huge accomplishment in that only about five out of 100 that start martial arts get to black belt. 6. Myth: Girls can’t do martial arts. This one has been around forever. It is amazing; some people still wonder why there are girls in the class. Fact: There are many outstanding female martial artists worldwide. In fact, the Kenpo Freestyle Sydney team, which I coach, is comprised of about 40% girls and women. Some of our best competitors are female. This team has been undefeated in the NSW ISKA rankings for five years in a row. That should tell you something. 7. Myth: After a few weeks of training you will be able to fully defend yourself. Fact: I hate to break it to you, but you will need at least six months to learn the basics, and probably at least a year after that of steady training to where you can confidently use it to defend yourself. Be patient and enjoy the process of learning and the self-defence aspects will take care of themselves. Myths about martial arts are perpetuated through hearsay and exaggeration. Children are particularly susceptible to these ideas as they have no experience with which to judge reality vs. fantasy. It is my job as a children’s martial arts sensei to see that they know the truth. Do you have any myths you wish to add? Have at it! Top Seven Myths Children Believe About Martial Arts is an original article by Sensei Matt Klein. 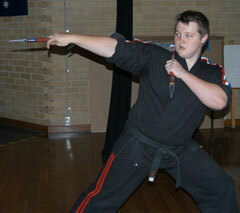 For more information about the Kenpo Freestyle Sydney team follow this link. Kids MMA: Yes or No? Mixed martial arts for kids is a hot debate now. MMA is a combination of grappling arts like Brazilian jujitsu, judo, wrestling and stand-up arts like Muay Thai, kickboxing, and karate. In an MMA match the goal is to knock out your opponent or make them submit. Bouts are fought in a cage. There are states in the U.S. that allow kids to fight in the cage, even at seven or eight years old. Videos of fights between kids under the age of ten without any head protection have appeared on YouTube, and with a drunk crowd going crazy in the background. In one video an eight year-old lifts another high off the ground and pile-drives him right down on his head and neck. Gyms around the U.S. are teaching MMA classes to kids as young as five. The question is, should children be allowed to take part in this popular but potentially dangerous sport? If so, at what age is it safe to start? Kids have been doing amateur boxing for years, which involves repeated blows to the head, even though they wear headgear. Kids play rugby, ice hockey, and gridiron, and some get concussions, even with headgear. Other sports like motocross, snowboarding, gymnastics, or skateboarding have a higher injury record. Oddly enough, cheer-leading is one of the most dangerous activities in the world. The lower knockout rates in MMA compared to boxing may help prevent brain injury in MMA events. Cardiovascular fitness is enhanced through aerobics exercise, including jumping rope, sparring in the ring or running. Muscular conditioning is improved through calisthenics like push-ups and pull-ups or weight training, although weight training is not recommended for youngsters. For self-defence skills MMA is one of the best things your child can learn. The combination of stand-up and ground fighting prepares the student for a real fight better than anything else. Children don’t have to compete in MMA while learning it. Brazilian jujitsu and grappling competitions are held regularly and allow children to compete safely. Taking repeated blows to the head before a child’s brain is fully developed can cause problems. Even with headgear it is dangerous. Kids should not be punching each other in the face with full power. Young children are rewarded for punching, kicking, twisting the limbs, and physically attacking one another. By regularly physically hurting others, a child can become more desensitised to their pain. Severe dieting to make weight limits is not good for the body, especially for kids. Some parents might make their kids fight whether they want to or not, if it were legal. Who will protect children from ignorant parents that wish to live vicariously through their kids? If you start a fight career at nine years old, what condition will your body be in after ten years of being punched, choked, ground-and-pounded, having your joints hyper-extended and knocked out? Isn’t that when you should be starting your career, not finishing it? A common criticism is that important things like respect, self-discipline, and courtesy are not being taught in mixed martial arts classes. A compromise is to teach MMA techniques and let kids practice it, but not fight competitively until they are at least 16 or 17. When the student turns 18, they can make their own decision. Kids should be taught under the supervision of an experienced instructor who controls sparring or grappling (rolling) very closely. Any type of practice for competition or actual competition should have strict safety precautions. Respect for others, self-discipline, and courtesy should be taught just like in traditional martial arts. While training, the following rules should be enforced. #1. No elbows or knees allowed. No kicks to a downed opponent, including the body or legs. #2. All fights should be limited to two rounds, two or three minutes each. #3. Headgear and shin guards must be worn. The important thing is that you and your child are comfortable and that the children are training in a safe environment under quality instructors. 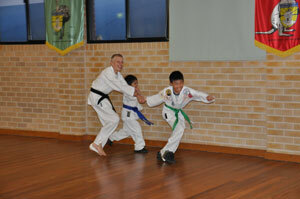 Our martial arts for kids program in Sydney recently added teens MMA classes at selected locations. We went ahead with this due to popular demand. It is the fastest growing sport in the world, you cannot deny it. We have been teaching grappling and elements of Brazilian jujitsu since before 2000, so it was a natural to include it in our program. This is an original article by Sensei Matt Klein. Kids love martial arts classes because they learn how to protect themselves. 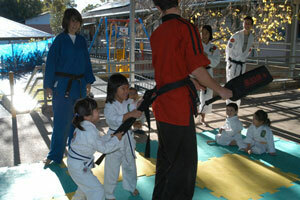 Children love martial arts classes. There is no debate about this. But why? The reasons might surprise you–there are as many reasons as there are children in the martial arts. I decided to pose this question to some of my kids classes, and we came up with some interesting answers. I told the children there is no such thing as a wrong or bad answer, and that they should say the first thing that crossed their minds. I did not judge any answers as we went along. I never knew how much fun “kid brainstorming” can be. We had lots of laughs. But I was very impressed with the maturity of the children and their willingness to put their hands up and comment. Please add your own reasons why you love martial arts in your comments section below. Your feedback is valued and appreciated. 1. “It’s fun”. This is the most popular answer by the way. 2. “It can save your life”. 4. “In case someone is trying to hurt you”. 5. “We learn new things in the classes”. 6. “When we play the games”. 7. “Because we get to spar”. 8. “It is good practice for fighting”. Not sure I wanted to hear this. 9. “Every week we learn something new”. 11. “We make new friends”. A popular answer. 12. “We try our best”. 13. “We learn how to do karate”. 14. “It’s fun and we learn something at the same time”. Mature child here. 15. “We play fun games”. 16. “We can teach others”. 17. “We can avoid the punch or kick from the bully”. 18. “Karate is just cool”. 19. “All of my friends think I’m cool because I do karate classes”. Hope there are other reasons too. 20. “We learn good techniques”. 21. “I’m going to be a karate master”. 23. “We learn katas and lots of different moves”. 24. “Somebody’s going to get scared if they’re attacking me”. This one had the whole class laughing. 25. “It controls me” (It allows me to control myself). 26. “I learn to talk to the class”. 27. “I learn things from the games”. 29. “We learn self defence”. 30. “We play games that can help us”. 32. “We keep our balance”. 33. “We help people if they are sick”. Wish everyone was this kind. 35. “It is good for making friends”. 36. “We get taught self defence and how to get out of fights”. 37. “Because you get to block the soft things” (drills with padded blockers). 38. “It is interesting and fun”. 39. “It makes you feel refreshed and strong”. 40. “It is great for self defense”. 41. “It is fun and active. 42. “If someone tries to hurt you, you can protect yourself”. 43. “We learn new skills”. 44. “We learn the katas for every belt”. 45. “Can beat up people that are picking on you”. Ah-oh! 46. “We learn a new sport that gives us safety”. 48. “I learn to protect myself as a girl”. 49. “I learn karate because it’s better to block”. 50. “We learn lots of things”. 51. “We learn blocking and kicking”. 53. “Because we get our badges”. 54. “Because we get our belts when we do something good”. 55. “We learn how to do all the stretches”. 58. “Makes us strong and powerful”. In a martial arts class kids love to have fun and make friends. 59. “If someone attacks, we put our hands up”. 60. “We try our best”. 62. “We learn how to bow in”. 63. “We do front and back kicks”. 64. “We know how to block the bully’s punches”. 65. “We know how to kick behind us”. 66. “We learn to teach others”. This was another popular reason. 67. “If you can’t do it you keep trying”. 68. “I forgot”. Another popular reason. 69. “We get belts and suits”. 71. “You can do karate with all your friends”. 72. “You get to move up a belt”. 73. “We have a good time”. 74. “It makes you healthy”. 75. “If someone tries to attack, use karate”. 76. “The games and warm-ups are fun”. 77. “We can help people if they are getting hurt”. 79. “If they are attacking, you have to kick the lot of em”. Funny answer. Martial Arts Classes: 79 Reasons Why Kids Love Them is an original article by Sensei Matt Klein. 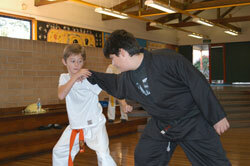 Check out our related page about the benefits of kids martial arts instruction. Kids Karate Tournaments: Good or Bad? 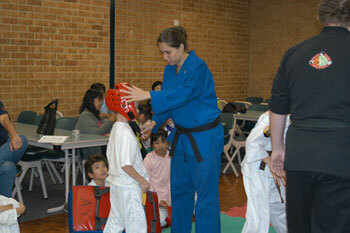 Karate tournaments can build the skill and confidence of children. The scene: A kids karate tournament in any city or town. Two karate kids clash in the center of the ring in sparring competition. It is overtime. The score is tied 4-4. The next point will determine who will get a trophy and who will go home empty-handed. One child lunges across the ring with a mighty kiai and scores with a punch to the other’s chest. He pumps his hands in the air as the judges declare him the victor. He looks to his parents, who are hoarse from yelling and screaming, for approval. They are all smiles. The other child bows his head in despair as the tears flow. This is his third tournament and he has not yet won a trophy—so close this time. He cannot bear to look at his parents. I feel his pain. Are Karate Tournaments for Kids Good or Bad? Are karate tournaments healthy for kids? This is an interesting question as it can apply to any sport. Our competition team, Kenpo Freestyle Sydney, has broken records for the most championships in the International Sport Karate Association in Australia. The team has been the number one ranked team for five years in a row. You might expect me to be a bit biased on this subject. I am. I believe the positives outweigh the negatives, when it comes to karate competition for kids. I will discuss why here. I would also really appreciate your comments for or against kids in karate competitions, or perhaps any sports competition. While getting ready for tournaments, kids practice a lot. Tournament competitors practice about three times as much as your average karate student. This pays off as they progress much faster in their ability. The tournament competitors get the attention of the top instructors, who take time to work with them. This training is often one-on-one. Kids learn to handle pressure and perform. Doing this consistently helps them to overcome stress with grace—a key life skill. A good coach will know how to motivate competitors to perform well, further building their self-confidence. Karate competitors also learn how to overcome disappointments and perservere. They learn from their mistakes and don’t give up. In my experience, martial artists with a competition background make the best instructors—they have forged their skills the heat of competition and now have the confidence to help others. Kids and parents alike will build a strong camaraderie with each other at tournaments. Competitors stand around the ring and cheer and clap loudly for their team-mates. Tournaments foster the importance of sportsmanship. Shaking hands with other competitors after their events is strongly encouraged. Words of support to other competitors who had a bad day are routinely offered. In some instances, stronger competitors let weaker ones score a point or two just so the weaker ones leave with a feeling of pride. Children learn in competition that sometimes you win and sometimes you lose. This is an important lesson to learn about life. Not everyone will be a winner. Some will quit martial arts because they are so disappointed. Karate tournaments can be very expensive. If a student is competing regularly, it can run into the thousands of dollars per year. For families, it is even more expensive. Kids that don’t compete might feel left out. The pressure can be too much for some children; especially if coaches and parents put too much emphasis on winning. Non-competitors should also be given the opportunity to show their skills. Everyone who competes should be recognised, win or lose. We call all competitors up for a clap in front of the class and recognise them for their bravery and willingness to have a go. We do not pressure kids to go to tournaments. If they want to go and if the family can afford it, that’s fine. We try to recognise non-competitors for their achievements in class; for instance kids get to demonstrate techniques in front of the class if they do them well. For kids that are having difficulty coping with the pressure, we try to give them extra encouragement. As coaches, we never show anger or disappointment at our students’ performance. We support them and try to help them do better next time. If we see a parent getting a little heated about the results of their child’s outcome, we might have a talk with them. We want kids to have fun, make friends, and be inspired by their team-mates performances. Most importantly, we want them to enjoy their day at the tournament. That is what it’s all about. A good sensei can help build a child's self confidence in a safe and friendly environment. Martial arts schools can be great places to build self confidence in children. Self confidence plays a very important role in our happiness and success in life. It is crucial that children are given the opportunity to develop it at a young age. Here are 20 ways in which a good martial arts school can improve a child’s confidence. If you can think of any more, please feel free to add your comments below. Children will imitate their parents or other role models. A good sensei will provide an excellent role model for the children to imitate. The sensei will have the body posture and movement typical of a confident, successful person. When a sensei truly enjoys being with the children in the class and is obviously having fun, the kids will come away thinking that they are fun to be with. By getting down and playing with the children, the sensei makes the children feel valuable, especially if she focuses her attention on them. By knowing their names and repeating them, the sensei reinforces the child’s sense of self-esteem in their minds. 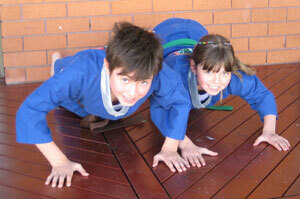 The carry-over principle—success in martial arts will carry over into other areas of the child’s life. By discovering what the child is good at and praising her for it, the sensei will build her self confidence. A good sensei will help a child lose his “labels”. There are no “fat kids” or “asthmatic kids” in martial arts schools. There are only karate kids, or whatever art is being taught. By teaching good values, the sensei is able to help the child decide for himself what is right in the face of peer pressure. By giving children responsibilities, they become more confident. Once the student reaches a high rank they are expected to help out the younger, less experienced students. This greatly increases their sense of responsibility. A good sensei will encourage students to ask for help if they need it. This builds assertiveness, a key ingredient in self confidence. The sensei will help a child overcome any negative self-talk that might be holding him back. “You can do it” is one of the sensei’s favourite phrases. Students will learn to accept mistakes as part of learning. They will make plenty, but each day they will get better and will learn that mistakes are no big deal—even the sensei makes them! Good martial arts schools will break the belts down into bite-sized chunks so the children are able to achieve success. Each step towards the goal will build a layer of self confidence. The child will learn that with a bit of work and determination, success can be obtained. Children need limits to feel secure. The sensei will have rules that must be followed in the dojo, giving all students proper guidance. Taking healthy risks builds a child’s confidence. In martial arts there will be some risks, particularly in the higher ranks, but there is no success without the chance of failure. There will be failures along the way, but they will be overcome, with determination and persistence. This process builds confidence. The sensei will show your child how to make proper eye contact in order to project confidence. A good sensei will encourage your child to put his hand up and answer questions, which will make him much more confident. The student will have a chance to observe how people are motivated and inspired—from watching the sensei. The martial arts training itself will build strength, skill, and confidence, which will also repel bullies. The sensei will recognise improvements and effort as part of the process of learning, rather than just the end result. Great martial arts schools are in every city. Give your children the gift of confidence and find one nearby.